Just adorable – love the chevrons, love the color combo and love the monogram! So cool! I had never heard of a ‘silhouette’ before…only the circut…Now I want one! I am diggin those chevron stripes, but I wanted to see a pic of the plate hanging on the wall with all the others! I found you at the creative girls blog hop. Stop by some time and say hi! Oh my gosh! I love this idea! I unfortunately don’t have a cricut and I wish I did because I am seeing vinyl everywhere and there are so many great ideas! Do you sale these? You totally should! I am so excited to be a new follower of your blog. You have so many fun ideas! Keep up the good work. You have a great blog! Found you on TTJ… LOVE this! Black, white and turquoise are perfection. I absolutely ADORE this! I love the chevrons and turquoise monogram! Awesome job! Thanks for the tutorial! I LOVE THIS!!!! I just found you through the Silhouette fb page – I saw your tutorial post and am so glad I did! I just ordered a Silhouette, and this might have to be the first project! Thanks for sharing this great idea! I love so many different things about this plate. The chevron, the colors, the cheapness of the supplies with a fabu professional outcome! LOVE! I love this! I keep seeing all these wonderful uses for Silhouettes, I think I need one! i was thinking about applying mod podge to vinyl for another project…this is the answer now for sure. Very stylish – you did an amazing job! Fabulous addition to your sentimental plate wall! It is gorgeous!!! Love the color combo! Very cute! Thank you for commenting on my blog bc now I found your amazing blog! I am your newest follower :) This project is awesome–cute, modern, cheap, and easy! It’s perfect!!!! Thank you for a great tutorial, I’m excited to read more of your blog! Thanks again for finding me! So cute!! I shared this on my FB page today. Hopefully you get some new lookers and followers. Saw you on CSI. WOW! Great job! I am so loving anything chevron right now. Love this-the contrast of the monogram is great. I might just have to attempt this myself! This is just darling. Well done. You have inspired me. I love that! Looks so professional!!! I wish I had that magical machine! will have to find a way without it! Thanks for linking up this week! I’ll be featuring this on my blog on Saturday! I love this plate !!! 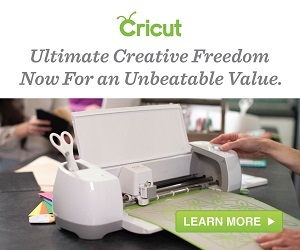 I need to see if I can find that for my cricut !!! This is just further proof that the simplest projects are the best!! I love it – and you made it look so easy! This is a sweet project and Ilove the plate of walls and how they tell a story. I just found your plate via Pinterest and think it is an amazing idea. I teach Pre K and I’m going to try this with the kids for a Mother’s Day project. Did you happen to use a glass or plastic plate and in your opinion, which one would work the best? Thanks for your help! I love your project!! I just featured it on my blog! I’m a new follower! That is such a great idea! I’m planning on doing a plate wall too. 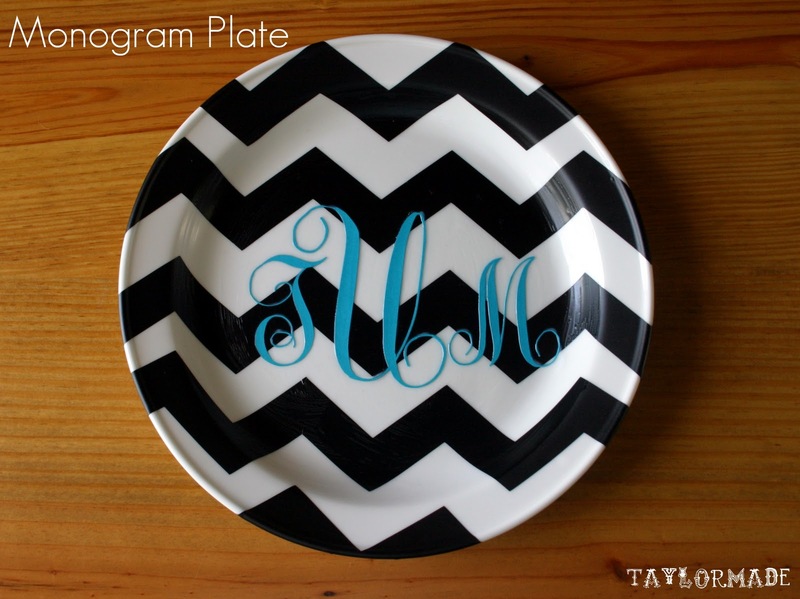 Will definitely try to add a chevron plate in there too. Thank you for sharing. Could you potentially eat off of this plate? Can I ask a question? Does Mod Podge dry “sticky” as I am reading that a lot online? hmmm how do i describe it?? its not super sticky but it does have some tackiness to it!